The Redemptorists » Do you need it or want it? 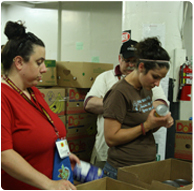 Sorting donations at a foodbank. The latest cell phone has some great applications, but do you really need it? The sandals that all your friends are wearing would look great on you, but your old sandals still have plenty of life in them. Do you buy new ones? These are just a couple of examples of something that is causing many people to reconsider their choices — do you need it or do you simply want it? As usual, the best source of answering a question such as this is Jesus. In the gospels, he complimented an elderly woman who had dropped two coins into the Temple treasury, which was all the money she had to live on. We might say that her generosity was foolish. In giving all her money to the Jewish Temple, she would not be able to buy food for the day. Jesus saw her gift in a different light. He recognized her overwhelming trust that God would take care of her needs. If she had to go hungry for that day, then so be it. Giving and buying are closely connected. The richest people on the earth are not those with the most money to buy things. The richest people are those who are content with what they have. I happened to be working as a priest in Dominica when the island first connected to cable television. Before cable TV, friends would play dominos or talk by the roadside well into the night. TVs only had a few channels and they were, for the most part, not too interesting. Slowly, as more and more homes hooked up to cable, channels like MTV and the BET Network became popular. Instead of meeting in the evenings to talk over events of the day, people remained at home. They began soaking in images of people in other parts of the world who were driving fancy cars, living in huge houses, and wearing the latest designer clothes. It was difficult not to want what these other people had. But, the question remains, are all these new things needed or merely wanted? There is no easy answer to this question. Wants and needs are sometimes so closely joined that it is hard to separate them. As Christmas rolls nearer on the calendar, reflecting upon our wants and needs could prove helpful. Possessions do not make a person happy. Living in step with God does. Most of what we see in stores or on TV has a price tag. Living in union with God is priceless.